Sit in the Throne of King Tut whenever you want when you own this amazing replica full size chair. Based on the actual throne from King Tut's tomb, this amazing replica chair is full size - 42 1/8 inches tall. Covered in gold leaf it is meticulously hand painted to match the original Ancient Egyptian artifact. 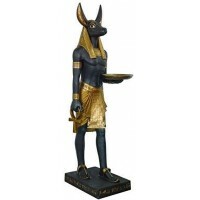 Made of cast polystone (ground stone in a museum grade resin base) and reinforced with wood and fiberglass, it is certain to be the centerpiece of your home or wherever you place it. Due to the size and weight, it can only be shipped via freight truck for delivery within North America. Item Number: UI-WU70259VA | Approximate Size (Inches): 40.00 wide x 40.00 deep x 42.18 high | Approximate Shipping Weight: 65.00 lbs.